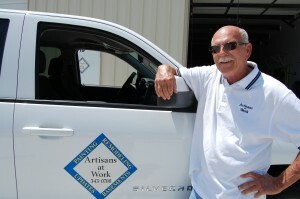 My name is Monte Sothmann, owner & operator of Artisans At Work, LLC. I have been a painting and general contractor in the metropolitan Omaha area since 1974. I continue a proud family tradition of home renovation contractors into its’ third generation. This tradition and experience brings a wealth of material, product, equipment, methodology and design knowledge to each project my company undertakes. I keep my company small. I don’t believe quality craftsmanship can be provided in a “high volume” atmosphere. Each member of my team of professionals has been chosen for attitude, work ethic and willingness to learn and is extensively trained in multiple trade applications. Each of us continues to learn and improve his and her skills and abilities by outside study, seminars and each job performed. We are always driven by the question, how can we do it better? Our company goals are simply to do the best we possibly can on every task we perform. Treat our clientele and their property with absolute respect. Finish each work day with a sense of pride in what we have accomplished. To be the best, of the best, at what we do. We are licensed, fully-insured and a long term Honor Roll Member of the greater Omaha Better Business Bureau. Please take a moment to familiarize yourself with the services we provide. For questions or a free estimate, call 343-0700 or use our contact page.